One of the best things about being a faculty member is the incredible flexibility during the summer. Although I am only on a nine-month contract and have to hustle for grant or contract funding to maintain a nice standard of living (here is what I did last summer), it’s great to be in almost complete control of my schedule for three months out of the year. I had the pleasure of spending much of early June on the road in the Midwest, mixing some time with my family and friends alongside more typical academic obligations. Here are some musings from 900 miles behind the wheel across some of the most beautiful scenery in America. After some time with my parents, my wife and I went to Kansas City for a friend’s wedding. But since we are both Truman State University alumni, we had to make a stop at the Harry S. Truman presidential library in Independence, Missouri. 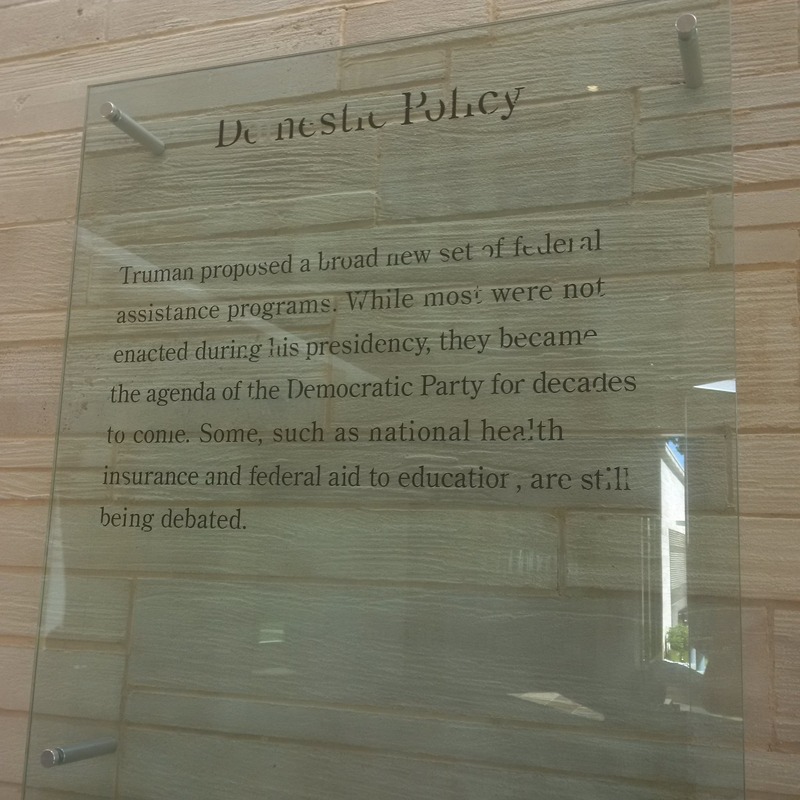 In the midst of all of the exhibits (including the famous Zimmermann Telegram), there was a well-worn display on some aspects of Truman’s legacy that are still being debated today. Truman is well-known in higher education circles for the commission that he established, and many of these ideas keep popping up on a regular basis. We then took a walk in downtown Kansas City, which has been revitalized over the last decade. (Ed policy friends: you’re going to love going to AEFP there next year!) 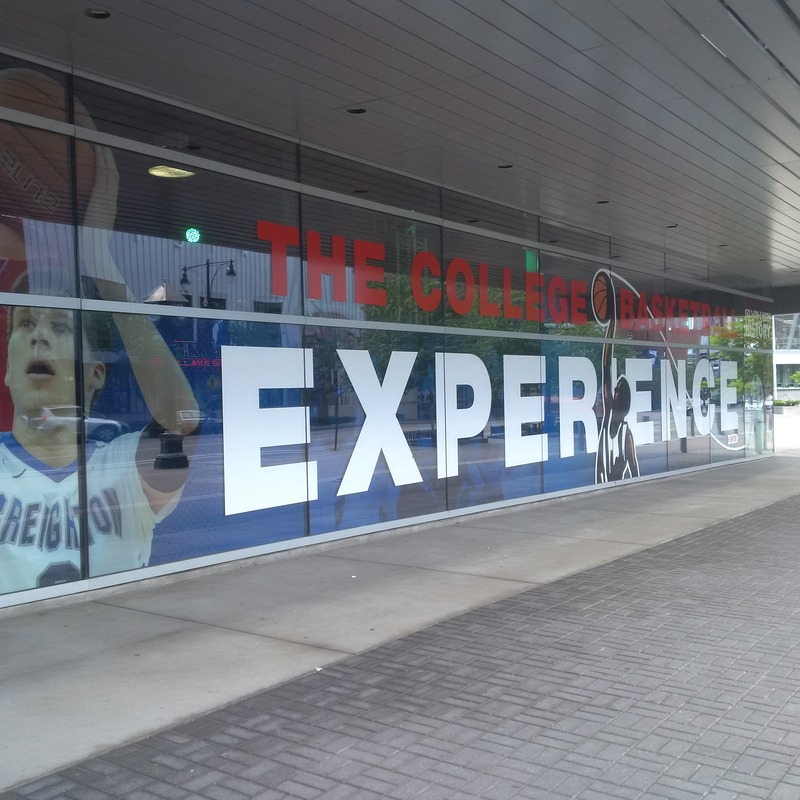 One of the downtown attractions is the College Basketball Experience, which also hosts the National Collegiate Basketball Hall of Fame. I was struck by the graphic outside the building, which prominently featured a Creighton basketball player. This raises questions about whether players should be paid for their likenesses, even when the organization using the likeness is nonprofit. After a gorgeous drive through corn and soybean fields (and listening to a near no-hitter on the radio), I was in Champaign, Illinois for a conference on state funding volatility in higher education hosted by the University of Illinois. Illinois knows something about the topic, but it was good to see a sense of normalcy (and construction cranes!) after a second year of consistent state funding recently came through. I presented my draft paper examining whether star research faculty members leave public research universities after state funding cuts—and I found little evidence of this. (Thanks to Eric Kelderman for this nice writeup in The Chronicle!) 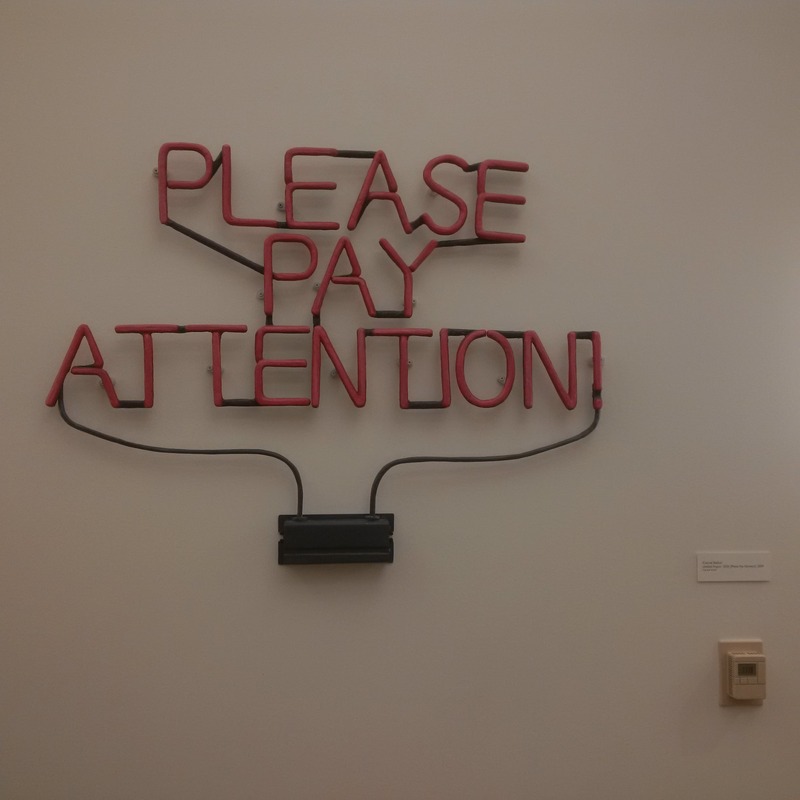 I also enjoyed the art outside the conference room, including this nice sign that would look great in my office. I was then back in New Jersey for a few days to chair a dissertation defense and cut the grass before heading to Minneapolis to give a talk on higher education accountability at the Lawlor Group’s Summer Seminar for administrators at private nonprofit colleges. I usually speak with policy and scholarly audiences, so it was great to learn from a different group of people over the course of two days. It has been great to travel around for a while over the last few weeks, but now it’s nice to be back in New Jersey for a prolonged stretch of time. Time to write! I enjoyed reading this recent piece in the Chronicle of Higher Education that looked at the “ring by spring” pressures that students at some Christian colleges face to be engaged by graduation. I looked into factors affecting marriage rates across colleges in a blog post earlier this year and found a nearly six percentage point increase in marriage rates at religiously-affiliated colleges between ages 23 and 25 relative to public institutions, as shown in the figure below. As a data person—and someone who married his college sweetheart only three years after graduation—I wanted to share a dataset that I had already compiled for that piece so people can look through to their heart’s content. It contains data on 820 public and private nonprofit four-year colleges from the Equality of Opportunity Project, with marriage rates for cohorts ages 23-25 and 32-34 in 2014. The three colleges featured in the Chronicle piece all have higher-than-average marriage rates by age 25, with Cedarville University having a 41% marriage rate, Houghton College having a 34% marriage rate, and Baylor University having a 18% marriage rate. You can download the dataset here, and have fun exploring the data! A special thanks to Carol Meinhart for catching a silly error in an earlier version of the dataset, where the two marriage rate column headings were switched. It has since been fixed. This piece originally appeared at the Brookings Institution’s Brown Center Chalkboard blog. Young adulthood is not only the time when most people attend college, but also a time when many marry. In fact, college attendance and marriage are linked and have social and economic consequences for individuals and their families. When (and if) people get married is an important topic due to the presence of what is known as assortative mating. This phenomenon, in which a person is likely to marry someone with similar characteristics such as education, is a contributing factor to increasing levels of income inequality. In some circles, there is pressure to marry someone with a similar pedigree, as evidenced by the high-profile Princeton alumna who urged women at the university to find a spouse while in college. For people attending less-selective colleges, having the possibility of a second household income represents a key buffer against economic shocks. In this blog post, I use a tremendous dataset compiled by The Equality of Opportunity Project that is based on deidentified tax records for 48 million Americans who were born between 1980 and 1991. This dataset has gotten a great deal of attention on account of its social mobility index, which examines the percentage of students who move well up in the income distribution by young adulthood. I use the publicly available dataset to examine marriage rates of traditional-age college students through age 34 based on their primary institution of attendance. In particular, I am curious about the extent to which institutional marriage rates seem to be affected by the institution itself versus the types of students who happen to enroll there. My analyses are based on 820 public and private nonprofit four-year colleges that had marriage rates and other characteristics available at the institutional level. This excludes a number of public universities that reported tax data as a system (such as all four-year institutions in Arizona and Wisconsin). The first two figures below show the distribution of marriage rates for the 1980-82 and 1989-91 birth cohorts as of 2014 for students who attended public, private religious, and private nonsectarian institutions. Marriage rates for the younger cohorts (who were between ages 23 and 25) were low, with median rates of 12% at public colleges, 14% at religiously-affiliated colleges, and just 5% at private nonsectarian colleges. For the older cohort (who were between ages 32 and 34), marriage rates were 59% at public colleges, 65% at religiously-affiliated colleges, and 56% at private nonsectarian colleges. There is an incredible amount of variation in marriage rates within each of these three types of colleges. 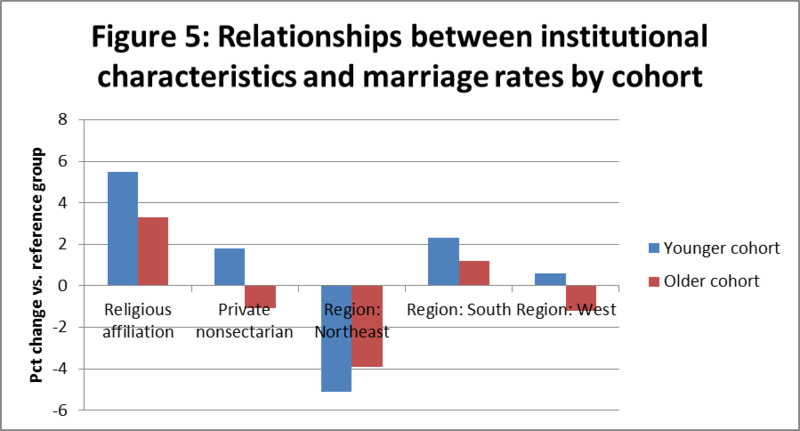 In the two figures below, I show the colleges with the five lowest and five highest marriage rates for both cohorts. In the younger cohort (Figure 3), the five colleges with the lowest marriage rates (between 0.9% and 1.5%) are all highly selective liberal arts colleges that send large percentages of their students to graduate school—a factor that tends to delay marriage. At the high end, there are two Brigham Young University campuses (which are affiliated with the Church of Jesus Christ of Latter-day Saints, widely known as the Mormon church), two public universities in Utah (where students are also predominately Mormon), and Dordt College in Iowa (affiliated with the Christian Reformed Church). Each of these colleges has at least 43% of students married by the time they reach age 23 to 25. A similar pattern among the high-marriage-rate colleges emerges in the older cohorts, with four of the five colleges with the highest rates in students’ mid-20s had marriage rates over 80% in students’ early-30s. A more fascinating story plays out among colleges with the lowest marriage rates. The selective liberal arts colleges with the lowest marriage rates in the early cohort had marriage rates approaching 60% in the later cohort, while the 13 colleges with the lowest marriage rates in the later cohort were all either historically black colleges or institutions with high percentages of African-American students. This aligns with the large gender gap in bachelor’s degree attainment among African-Americans, with women representing nearly 60% of African-American degree completions. Finally, I examined the extent to which marriage rates were associated with the location of the college and the types of students who attended as well as whether the college was public, private nonsectarian, or religious. I ran regressions controlling for the factors mentioned below as well as the majors of graduates (not shown for brevity). These characteristics explain about 55% of the variation in marriage rates for the younger cohorts and 77% of the variation in older cohorts. Although students at religiously-affiliated institutions had higher marriage rates across both cohorts, this explains less than five percent of the overall variation after controlling for other factors. In other words, most of the marriage outcomes observed across institutions appear to be related mostly to students, and less to institutions. Colleges in the Northeast had significantly lower marriage rates in both cohorts than the reference group of the Midwest, while colleges in the South had somewhat higher marriage rates. The effects of institutional type and region both got smaller between the two cohorts, which likely reflects cultural differences in when people get married rather than if they ever get married. Race and ethnicity were significant predictors of marriage. Colleges with higher percentages of black or Hispanic students had much lower marriage rates than colleges with more white or Asian students. The negative relationship between the percentage of black students and marriage rates was much stronger in the older cohort. Colleges with more low-income students had much higher marriage rates in the earlier cohort but much lower marriage rates in the later cohort. Less-selective colleges had higher marriage rates for the younger cohort, while colleges with higher student debt burdens had lower marriage rates; neither was significant for the older cohort. There has been a lot of discussion in recent years as to whether marriage is being increasingly limited to Americans in the economic elite, both due to the presence of assortative mating and the perception that marriage is something that must wait until the couple is financially secure. The Equality of Opportunity project’s dataset shows large gaps in marriage rates by race/ethnicity and family income by the time former students reach their early 30s, with some colleges serving large percentages of minority and low-income students having fewer than one in three students married by this time. Yet, this exploratory look suggests that the role of individual colleges in encouraging or discouraging marriage is generally limited, since the location of the institution and the types of students it serves explain most of the difference in marriage rates across colleges. Every year, I take the 68 teams in the NCAA Division I men’s basketball tournament and fill out a bracket based on colleges with the lowest net price of attendance (defined as the total cost of attendance less all grant aid received). My 2015, 2014 and 2013 brackets are preserved for posterity—and aren’t terribly successful on the hardwood. My 2015 winner (Wichita State) won two games in the tournament, while prior winners Louisiana-Lafayette and North Carolina A&T emerged victorious for having the lowest net price but failed to win a single game. A big congratulations to Fresno State and the state of California for winning this year’s edition of Net Price Madness across both categories. Every year, I take the 68 teams in the 2015 NCAA Division I men’s basketball tournament and fill out a bracket based on colleges with the lowest net price of attendance (defined as the total cost of attendance less all grant aid received). 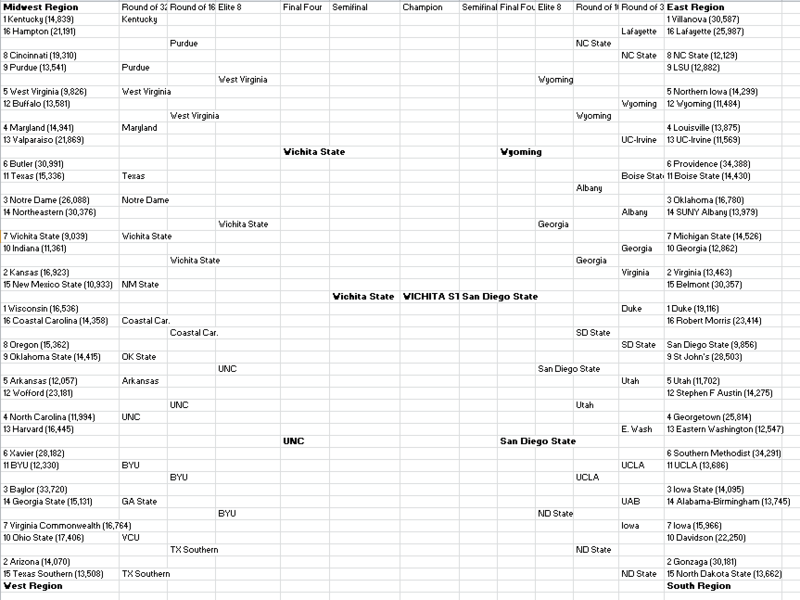 My 2014 and 2013 brackets are preserved for posterity, with Louisiana-Lafayette and North Carolina A&T emerging victorious for having the lowest net price without having won a single game. All data for the bracket can be found here. *NOTE: Wichita State has a reported net price of $9,039, but the net prices for each household income bracket are higher than $9,039. Something isn’t right here, but what would March Madness be without any controversy? Indiana deserves special plaudits for having a net price for the lowest-income students of just $4,632—although the 19% Pell enrollment rate is quite low. Also, thanks to Andy Saultz for catching an error in the VCU/Ohio State game. Much appreciated! It’s definitely springtime in most of the United States—the time of year in which the U.S. Department of Education initially said their draft college ratings under the Postsecondary Institution Ratings System (PIRS) would be released. Department of Education staffers have since stated that the timeline may be more toward midyear, but many observers wouldn’t be too surprised if the project were delayed even more given the difficulty of the task. Given the uncertainty of the draft ratings’ release, I think it would be fun to ask for predictions for the release date. Submit your guesses on this form, and leave your name if you want to be eligible to receive first prize: bragging rights for the next year. I’ll protect your anonymity and will contact the winner(s) to ask whether I can make their name(s) public. For what it’s worth, I’m predicting August 15. It almost has to be a Friday, and that is timed nicely with the start of the new academic year. But remember: my prediction is right or you get a full refund of the ($0) entrance fee! [UPDATE (5/21/14)]: Deputy Undersecretary Jamienne Studley announced today in a blog post that the draft ratings will be out “by this fall,” a delay compared to what has been previously announced. Libby Nelson at Vox also notes some of the difficulties in creating credible ratings in a new post. Is This America’s Coolest College President? With a few exceptions (such as the eternal leader Gordon Gee, now at West Virginia University), college presidents generally have a reputation for being a stoic, bland bunch of people. Given their job duties of managing a large business enterprise, raising funds, and dealing with often-cantankerous faculty members and students, college leaders rarely have a chance to have fun—and even more rarely show their sense of humor with the general public. Troy Paino, the president of Truman State University in Kirksville, Missouri (my undergraduate alma mater) stands out from the crowd. Often known around campus as “T-Pain” since his name can be shortened to that of the famous rapper, he is not afraid to be a little goofy in front of the camera. He made a YouTube video over last winter break talking about how much he missed the students, as Kirksville gets a little quiet over breaks. The video was fairly popular, getting over 10,000 views due in part to Paino’s reaction to what ended up being a pack of squirrels. Paino and crew decided to create another video this year, and this one has definitely gone viral with more than 30,000 views in the last week. Titled “T-Pain Misses You,” the video features Paino riding a toy tricycle around campus, measuring the height of the basketball hoops in Pershing Arena, and giving a heartfelt lip-sync rendition of a Miley Cyrus song in the campus radio studio (for more details on the video, see this nice article in the Kirksville Daily Express). This video has gotten coverage from the Huffington Post and may also be mentioned on Good Morning America. I expect to see more colleges produce videos like this in an effort to create a buzz around their brands and to attract prospective students. But, for now, Truman (ranked third in the Washington Monthly master’s university rankings) can enjoy the attention gained by its cool—and utterly nerdy—president. It is not surprising that college officials are proud of their institution. But a recent survey released by the Association of Governing Boards, a body representing trustees of four-year colleges and universities, takes this pride a little too far. Trustees were asked several questions about their own institution as well as about higher education in general, and in each case more trustees rated their own college much more favorably. The perception that one’s own institution is better than average is not just limited to higher education or Lake Wobegon. National surveys have consistently shown that parents give high marks to their child’s public school, while giving much dimmer reviews to other schools in their district or K-12 education in general. Perhaps Americans should consider that the great unknown as probably not as bad as they think—and that their own school may not be a paragon of excellence. When I started a line of research on college rankings and value-added, I assumed that if my work ever saw the light of day, it would be at least somewhat controversial. I’ve gotten plenty of feedback on my academic research on the topic, and most of that has been at least mildly encouraging. And I’ve gotten even more feedback on the Washington Monthly college rankings, most of which has also been fairly positive. This work has given me the opportunity to talk with dozens of institutional researchers, college presidents, and provosts from around the country about their best practices for measuring student success. “There are lots of things that I’ve long admired about your magazine. And for that reason, I had thought you might do a better job in the business of college rankings than U.S. News & World Report. But on reading this year’s issue, I was disappointed. In the Monthly college rankings, Nebraska Wesleyan University is predicted to graduate 66 percent, graduates 65 percent, and you rank us number 144 [out of 254] for that result. In my full response, I assured Mr. Ohles that it is my goal to never be a charlatan. But am I selling mathematical nonsense? You be the judge. Some of these potentially strange topics either have potentially useful applications or are just plain thought-provoking. To recognize some of the most unusual research in a given year, some good chaps at Harvard organized the first Ig Nobel Prize ceremony in 1991. This wonderful tradition continues to this day, with the 2012 ceremony being held yesterday. Real Nobel Prize winners are even known to hand out the awards! Ten awards are handed out each year, so it is difficult to pick the best award. My initial thought was to highlight the Government Accountability Office’s report titled, “Actions Needed to Evaluate the Impact of Efforts to Estimate Costs of Reports and Studies,” but this sort of report is not unusual in the federal government. So I’ll single out a nice little article on whether multiple comparisons bias can result in brain wave activities for a dead Atlantic salmon (no word on whether the study participant was consumed after completion of the study) as my favorite award. Multiple comparisons bias is certainly real and the authors provide a nice example of how to lie with statistics, but the subject tested sure is unusual. I encourage people to take a look at the other awards and try to figure out how these research projects got started. Some seem more useful than others, but that is the nature of academic research. The Annals of Improbable Research, the folks who put on the Ig Nobel ceremony, also have three hair clubs for scientists: The Luxuriant Flowing Hair Club for Scientists, the Luxuriant Former Hair Club for Scientists, and the Luxuriant Facial Hair Club for Scientists. Here is the full video of the ceremony.